We're back at Attica to try out the special Tuesday night menu where new dishes are offered in a 5 course (plus cheese if desired) tasting menu. As the food is new, wine matches aren't offered but they are more than happy to help advise you. 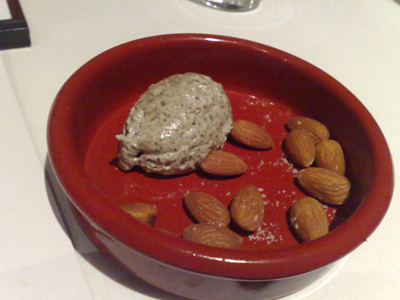 To start, mushroom cream with roasted almonds - the almonds were especially morish as was the mushroom cream, it's a shame we were only ever offered one small slice of bread. Once again our meal seemed to suffer from timing issues and we received our first course just after we finally got our pre-dinner drink - not that great of a problem as our drink suited the dish. 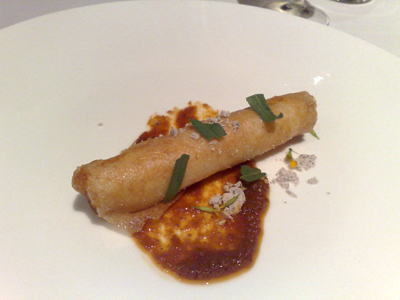 Prawn with Crispy Pastry - the prawns were wrapped in brik pastry and served with a spiced tomato sauce. 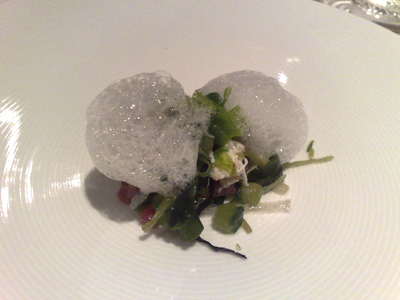 Salad of the Sea - sea foam crowns a salad of various sea vegetables along with crab and tuna. It was a little under seasoned and would have benefited with the presence of samphire. 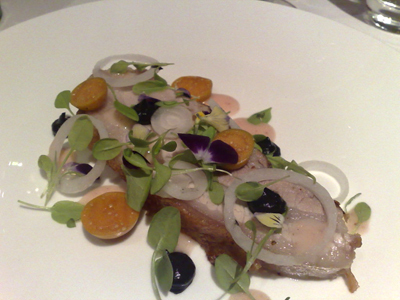 A good thick slice of pork belly though the cape gooseberries were a little on the too tart side. The beef was lovely and tender and still wonderfully pink, the slow cooked oxtail was at least equally as good as the beef. 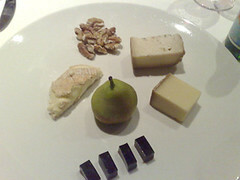 According to the menu there is a cheese course if you desire. 3 cheeses are on offer and you can have one or as we did, all three. The jelly was just too strong in flavour to be enjoyed, it doesn't sound right but I can only describe it as being like concentrated alcohol. The grapefruit fungi which are those white frilly components that you can more easily see on the toasted brioche and near the banana are as our waiter told us, wood fungus soaked in grapefruit juice. 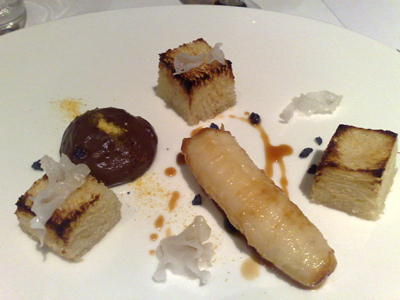 The banana is cooked in caramel though it had an odd bitter taste to it. This dish didn't really hit the right notes for us, a bit too sour and bitter though the toasted brioche was very nice. Once again there were misses in service - the timing of the first dish while we were still with a pre-dinner drink, our wine order not taken until we'd finished the first course, our glasses not being filled even when both were empty. 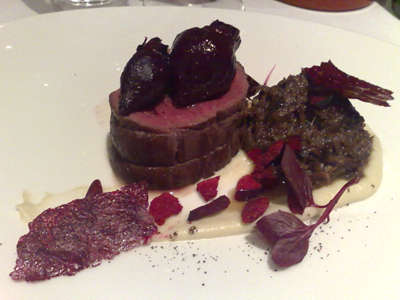 There was also quite a long gap between two courses almost as if our order had been stuck behind a larger tables order. Perhaps more wait stuff are needed but it seemed that some spent a lot of time behind the counter drying/polishing cutlery and glasses which is something you don't want to see especially when you're sitting in front of empty glasses.